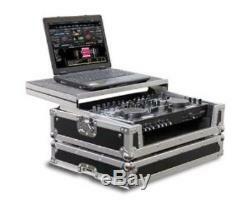 Flight ready glide style case for the dn-mc3000/dn-mc6000 dj midi controller new. Odyssey, ody usa, has brought hundreds of unique solutions to the dj and pro audio markets and continues to lead the industry with innovative designs with their pro audio bags, mixer cases, flight cases, laptop cases, road cases, krom cases, carpeted cases, trusses and stands, lighting gear, utility cases, and audio accessories. It is their goal to continue making products for the latest and hottest dj gear in the market today including the ever growing variety of dj controllers. They design and produce quality innovative products for the most popular dj controllers such as our pioneer ddj-sx cases and bags, pioneer ddj-ergo cases and bags, numark ns6 cases and bags, numark ns7 cases, traktor kontrol s2 tks2 cases and bags, traktor kontrol s4 tks4 cases and bags, reloop terminal mix 4 cases and bags, denon dnmc3000 / dnmc6000 cases and bags, and many others. Flight ready glide style case for the dn-mc3000/dn-mc6000 dj midi controlleru. Other foreign patents pending the odyssey flight ready frgsdnmc36000 case is designed to hold either the denon dn-mc6000 or dn-mc3000 dj midi controllers and features our patented glide style laptop platform. Each frgsdnmc36000 case has enough room underneath the controller to store cables and other essentials and also features rubber feet, ball corners, heavy-duty recessed handle and latches, and a front removable panel for easy access to the front input jacks. A black label version (frgsdnmc6000bl) and versions without the gliding laptop platform (frdnmc36000 and frdnmc6000bl) are also available. Check out my other items. Be sure to add me to your favourites list. The item "Flight Ready Glide Style Case For The Dn-Mc3000/Dn-Mc6000 Dj Midi Controller NEW" is in sale since Tuesday, June 7, 2016. This item is in the category "Musical Instruments & Gear\Pro Audio Equipment\Cases, Racks & Bags". The seller is "stores123" and is located in San Gabriel, California. This item can be shipped to United States.